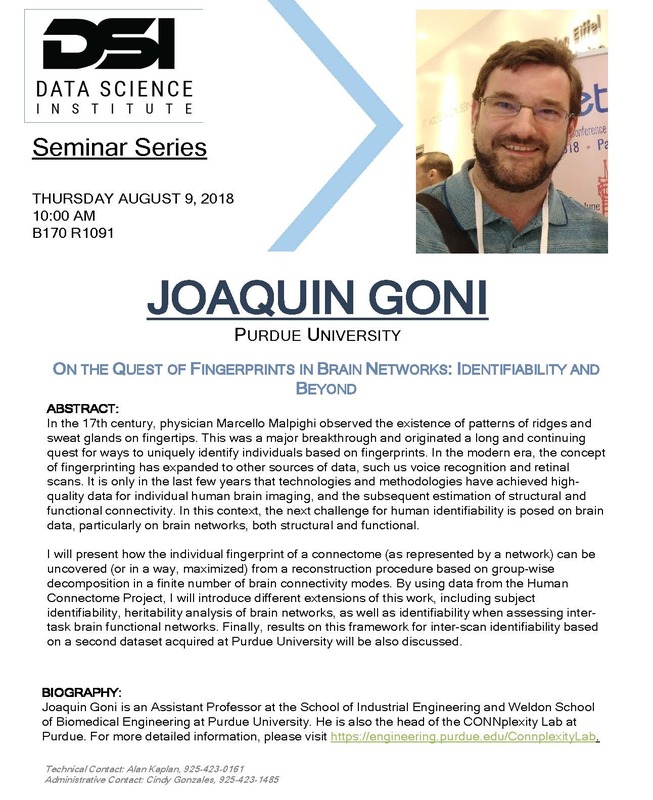 Goñi, assistant professor of industrial engineering, presented a seminar titled "On the Quest of Fingerprints in Brain Networks: Identifiability and Beyond" as part of the Data Science Institute (DSI) Seminar Series at the Lawrence Livermore National Laboratory in California on August 9. In the 17th century, physician Marcello Malpighi observed the existence of patterns of ridges and sweat glands on fingertips. This was a major breakthrough and originated a long and continuing quest for ways to uniquely identify individuals based on fingerprints. In the modern era, the concept of fingerprinting has expanded to other sources of data, such us voice recognition and retinal scans. It is only in the last few years that technologies and methodologies have achieved high-quality data for individual human brain imaging, and the subsequent estimation of structural and functional connectivity. In this context, the next challenge for human identifiability is posed on brain data, particularly on brain networks, both structural and functional. I describe how the individual fingerprint of a connectome (as represented by a network) can be uncovered (or in a way, maximized) from a reconstruction procedure based on group-wise decomposition in a finite number of brain connectivity modes. By using data from the Human Connectome Project, I introduce different extensions of this work, including subject identifiability, heritability analysis of brain networks, as well as identifiability when assessing inter-task brain functional networks. I also discuss results on this framework for inter-scan identifiability based on a second dataset acquired at Purdue University.